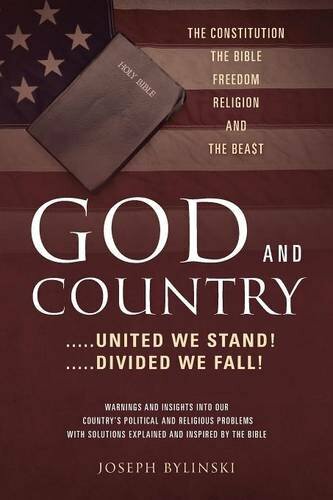 Within the pages of “God and Country,” author Joseph Bylinski has rearranged phrases in the bible to discover the mysteries hidden within. In doing so, he feels he has gained political insight showing to set the basis for how our democracy should be organized. Bylinski sees the bible as a “code book full of secret messages.” The author uses biblical phrases taken from the 1984 NIV version. He feels that the bible should have been used as the guide for laws. If God’s words are to help us stay on track, as a nation we have failed and strayed far away. We now try to resolves issues by throwing money at the problem. This results in creating debt, without resolving the issue. Unfortunately, many of the actions by the United States have also had a negative impact on the rest of the world. I gained a great deal of knowledge while reading “God and Country” by Joseph Bylinski. The author covers a great deal of topics such as those mentioned above and more, including the Quran. He makes a great deal of valid points. I was listening to the radio one day and not surprised when the announcers were discussing the rise in infidelity and how child custody laws need to be changed to reflect this issue. Instead of thinking that we should address the issue of infidelity, he felt we needed to change the laws so that they can catch up with the problem! What perfect timing that was for me. What the author has pointed out has really hit home in many ways. It is obvious that he did a great deal of research into the bible and politics to be able to sum up his ideas. Unfortunately, the pages are not numbered, even in the Table of Contents, making it difficult to use this book as a reference. I think most readers who follow religion and politics will find this book interesting and insightful.